Horror fans know that in 1978, it was the night HE came home. But movie fans also know that it was the night independent films came home, with the release of Halloween. Halloween was the first true independent film to not just do passably well, or jumpstart the career of an actor or director, but to do massively well, turning into an overnight mega-hit, and spawning 5 sequels. Back then, there weren't any fancy internets to spread rumors and hype movies, there was just expensive advertising and word of mouth. Independent movies were also really independent movies - if you were the daughter of a powerful Hollywood director, making a film starring Bill Murray, and being distributed by an arm of one of the largest movie companies on the planet, it wouldn't have been called an 'independent' film. But somehow John Carpenter managed to fight the mighty up-hill struggle, and put out a terrific film that has stood the test of time, and made a bundle of money to boot. It helps that he was hitting on all cylinders with this movie, and I personally feel that it's his best (although films like The Thing remake and Escape from New York aren't bad). The score, written by him because of budget constraints, was a classic destined to be copied over and over in the years to come. And he managed to snag a young actress in Jamie Lee Curtis who actually had talent, screaming her lungs out in abject terror one minute, and gouging out eyeballs with a coat hanger quite convincingly the next. 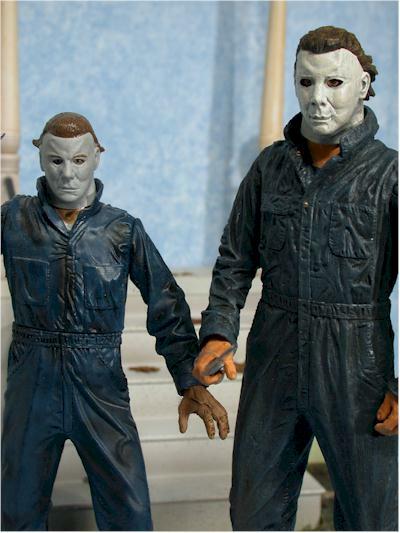 There's been a fair share of Michael Myers action figures over the last few years, but NECA felt strongly enough about the license to pursue and pick it up. But what could they do that was different? 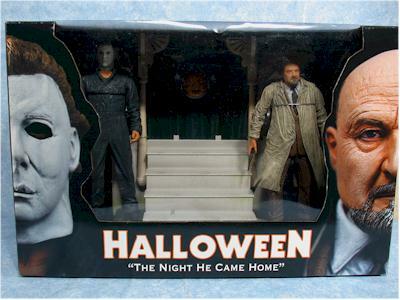 They've found something that works great - a boxed set of Michael Myers and his psycho-analytical nemesis, Dr. Loomis, together on the front lawn. 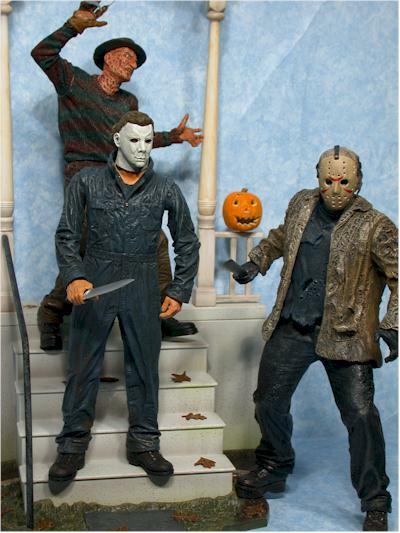 This set is very similar in style and quality to the Freddy Vs Jason boxed set NECA did last year, which was a huge hit. The suggested retail is $29.99, (but I have suggestions at the end of the review where you'll find it cheaper), and will be hitting stores like Suncoast, Media Play, Spencer's, and various on-line retailers in the next week or so, just in time for Halloween. The pair of figures are packed in a window box, both facing forward, with the front porch between them. It's a nice layout for the MIBBer, and the graphics and text are solid all around. If you hate twisties though, be prepared to do a lot of swearing. Whenever a company tries to put the figures in the box in a display type pose, they have to use a lot of twisties to keep everything in place. This particular example might have the most twisties I've seen all year, although the 18" Spider-man may still have the edge. If you plan on doing a figure that's been done before, and done well before, you have to do at least one of two things - do it better and/or do it differently. 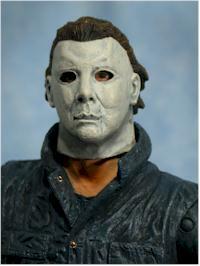 NECA has done both with this version of Michael Myers. 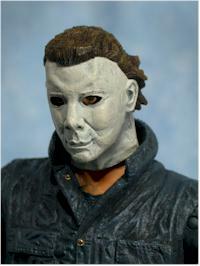 The sculpt on Myers is excellent, and is better than the McFarlane version. Of course, the McToys version was done 5 years ago, and you'd assume that the quality of both the sculpt and paint ops would improve over that time. 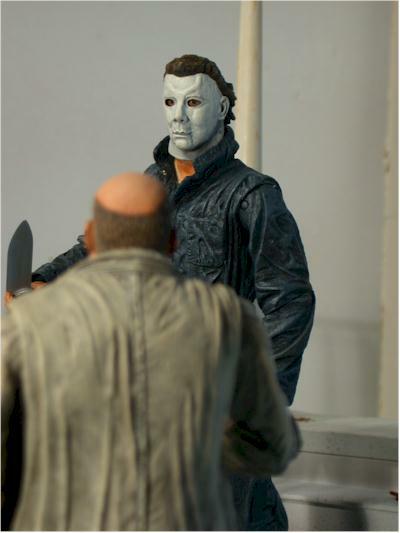 But NECA drives the point home that the bar is raised, with every small detail on the entire Michael figure. The head sculpt looks excellent, with deep set eyes, and extremely detailed hair. 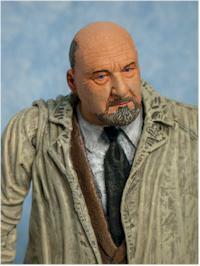 The clothing has wrinkles, buttons, and folds, and is sculpted to hang realistically off his body. The hand sculpts fit both the character and the weapon, and none of the articulation effects or hurts the sculpt. 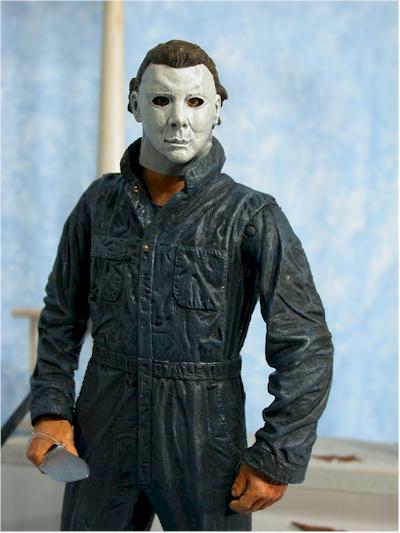 NECA could have just done a new Myers figure, but people would have been hesitant to buy, even if it was better. 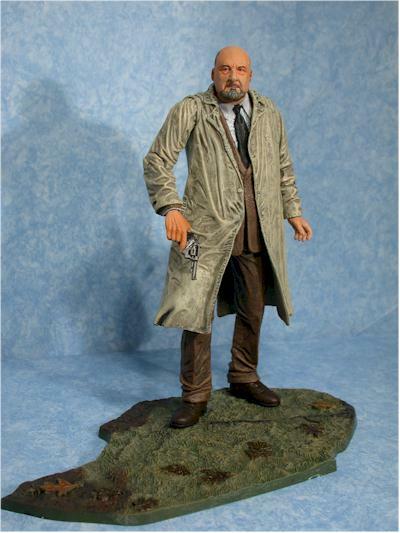 So they didn't just go one better, they went two better, and provided both an excellent display base and a much wanted second figure, Dr. Loomis. 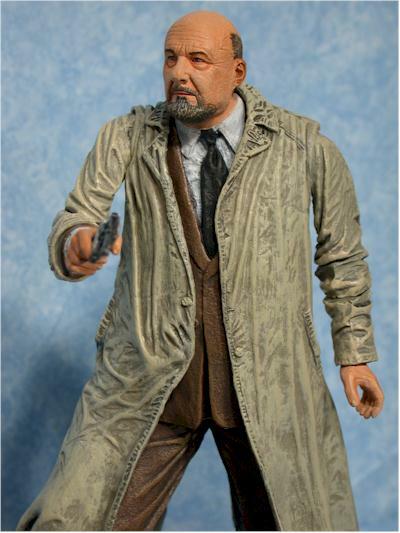 Loomis was played by Donald Pleasance, and actor who was in almost 200 movies and television shows. This role was the one that most folks remember him for though, perhaps because he played it in five of the six Halloween sequels. The work on the body is again solid, with lots of realistic wrinkles and folds. The suit and overcoat hangs well, and none of the added articulation gets in the way of the appearance. But the real beauty of this figure is the head sculpt. 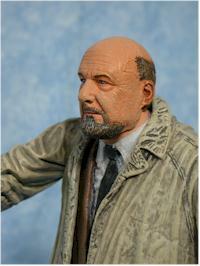 It not only looks just like Loomis, it looks tremendously realistic, even up extremely close. I shot tons of photos of both figures and the playset, and not a single one came out poorly. I can always tell great sculpting when the figures are this photogenic! The scale of these figures fits in well with the Jason Vs. Freddy set that NECA gave us last year, but the tower over the older Movie Maniacs. I've been saying it for years, so regular readers are probably tired of hearing, but it never stops being true - great sculpts can be ruined by bad paint ops, and even mediocre sculpts can be drastically improved with nice paint work. Here, the excellent sculpting is taken to another level with perfect paint ops. If you don't like washes though, you'll not like these. The clothes are all given a wash to bring out the details and create shadows that would naturally exist at full scale. None of the whites - including the white mask of Michael - are left bright white, but a bluish wash is used to give it more depth and shadow. The most impressive aspects of the paint application is the hair and eyes. 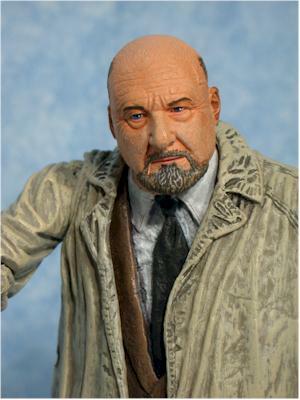 The facial hair on Loomis, and hair line of Michael, are absolutely perfect, with a nice clean and yet realistic division between the face and hair. There's just the right amount of gray in Loomis' beard, and the facial tone is great. Again, washes are used to highlight the wrinkles and details of the head sculpts, and in this case, I think it works amazingly well. These figures aren't super articulated by any stretch of the imagination, but are fairly well articulated considering the purpose of the set - as a display item. If you're a joint junky, then you won't be satisfied, but if you're looking for figures that look great on the shelf, with still a few posing possibilities, then you'll be more than happy here. Both figures sport a great ball jointed neck. That's huge, and gives you a tremendous amount of choice in the look of the figure. One of the simplest joints to alter or add to improve your posing choices is the neck joint, and it's great to see that NECA went the extra mile with a joint that is so versatile, and yet has no effect on the sculpt. Both figures also have ball jointed shoulder, cut elbows, wrists, and ankles. 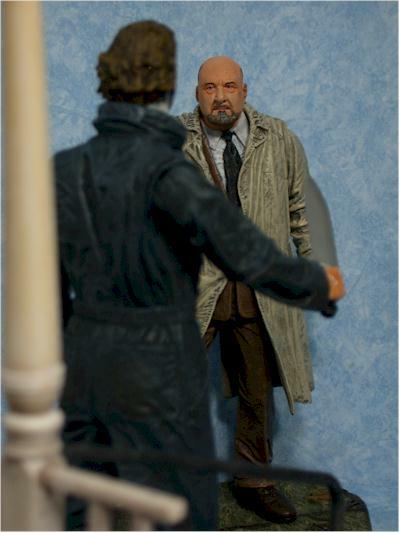 Loomis also has a cut waist, hidden by his suit coat, but Michael does not. I'm assuming that was to keep the clean, solid lines of his jump suit. While the ankle joints are super useful, they do allow you to keep the figures standing easily either on the stands or without them. The ball jointed shoulders are very useful, and the inclusion of the wrists and elbow cut joints makes it possible to do more with these figures than you might expect. There are a nice number of accessories here, all intended to go with the overall diorama scene. Let's start with the obvious, the front porch of Michael Myers home. The white paint is broken up with speckles of gray, along with a green staining from the grass growing up the front. There's a wash used in some areas, especially the posts, to give the impression of weathering and age. The hand rail looks like aged, damaged metal, just like the one my Grandparents had. The base actually comes in a number of pieces: the porch is a combination of several parts, and the grass lawn is actually three separate pieces as well. What that means is that you can either display the two figures together in the complete diorama, OR you can break it up and display the figures separately. That's another excellent touch, and really helps people with limited shelf space. The overall diorama is also very sturdy, and well constructed. Things go together tightly, but can be taken apart again without damage. While there are a number of leaves sculpted on the ground and porch, there are also seven or eight that are loose and can be placed anywhere. In my photos, those are the leaves laying around on the porch steps themselves. There's also a branch, distressed and beaten, that you can toss on the front lawn. 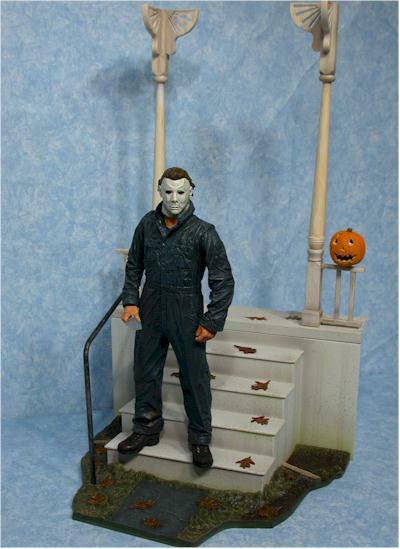 The diorama also has a jack-o-lantern that can either sit by itself, or attach to a peg on the porch railing. 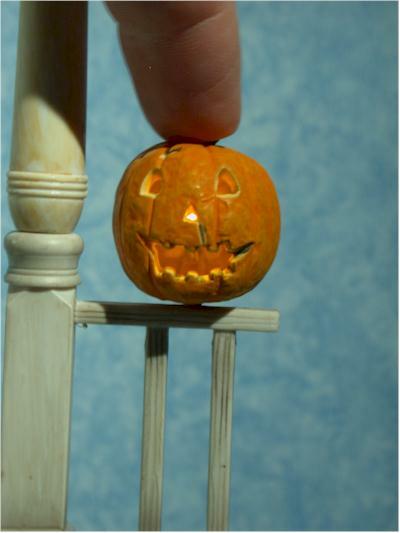 But this isn't just any carved pumpkin - it lights up brightly when you press the stem! There's also a wedge sign that says 'Halloween', similar to the small sign that came with the Freddy vs. Jason set. It's another nice little touch, and adds to the quality of the overall diorama appearance. 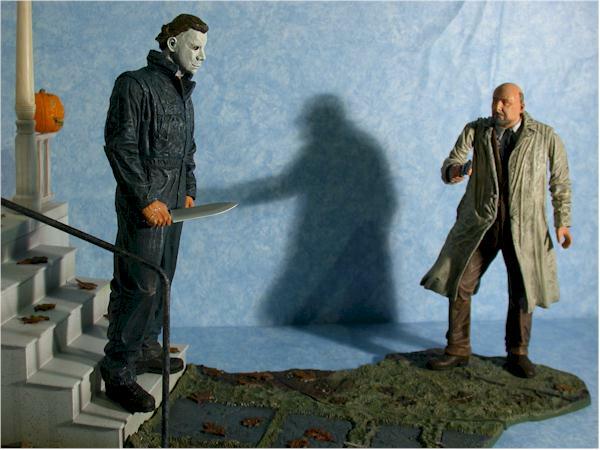 Finally, each figure has his signature weapon - Michael has his knife, and Loomis has his handgun. Both weapons look great, and fit fairly well in their hands, but I stuck with leaving the rubber bands wrapped around them to avoid losing them. There are a couple nits to pick - instructions would have been nice, if not critical. Sure, you should be able to figure out how things go together from the photos on the box, but adding in a simple instruction sheet would save some time for you. Also, if you notice from the box photos, you've lost something pretty cool that the prototype had - bushes on either side of the steps. I may have to take a trip to the local train hobby store to pick up some to add to the diorama. 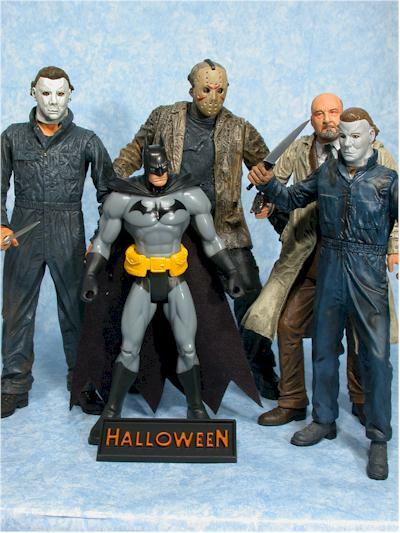 This is a great display set, and would work perfectly as a Halloween party decoration. Sure, your four year old probably won't have too much fun with it, but it does have the elements of fun for adult fans. I'm judging this on the thirty dollar suggested retail, but in reality, you should be able to do much better. At thirty bucks, even with the front porch steps and lawn, is at least five bucks too high. However, if you get it closer to $20 at one of the on-line retailers, you can add another half star to a full star, because of all the exceptional accessories and diorama base. I don't give out many four stars, but this set is really impressive. 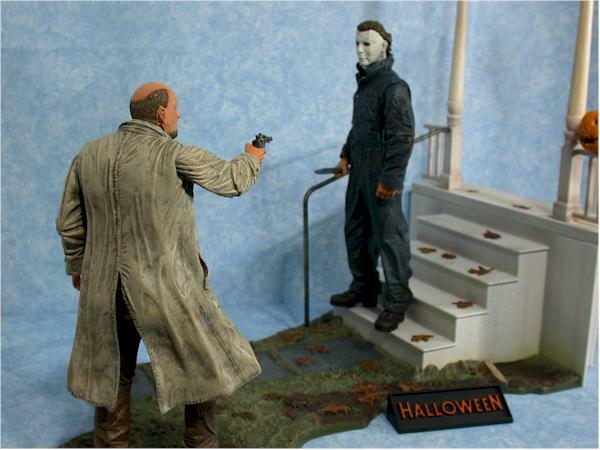 It's going to be up there in my picks for best playsets or dioramas of the year for 2004, and if you're a fan of the Halloween license, it really is a must buy. 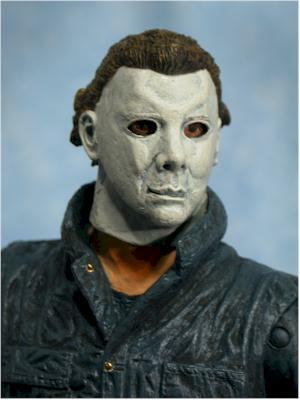 McToys version of Michael Myers was exceptional five years ago, but the bar continues to go up, even for them. 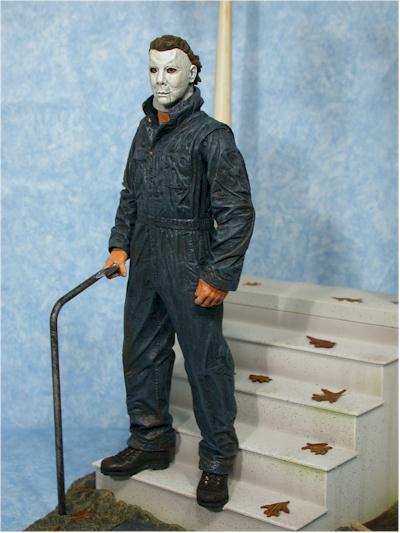 NECA has managed to produce a fantastic looking version of Michael, plus give fans the excellent Loomis figure, and a wonderful diorama for them both. 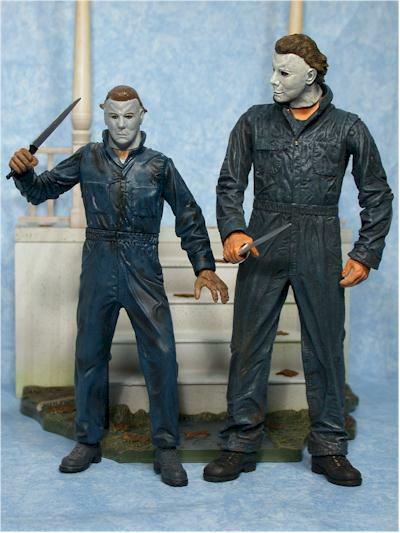 With this kind of work on the smaller scale Myers, I'm really looking forward to what they do with the 18" version due later this year. - Alter Ego Comics has the set for less than $21, so even with shipping it's a much better deal than SRP. - Killer Toys has the set for $22. - CornerStoreComics has the set for $23.